So. 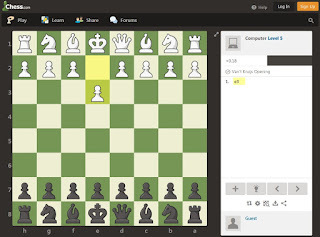 Been bashing my head against the computer opponent at Chess.com, rather fruitlessly. Maybe that's due to having always lacked the intellect to be any good at chess in the first place. Maybe it's because I haven't played in almost precisely twenty years. Maybe it's because I mostly don't stop to consider my moves and rarely pay attention to what the computer's doing but just keep clickity-clacking my pieces until I fall off a cliff. Whatever the cause, I can't get any higher than level 5. Amusingly enough it's possible to ... "rattle" the computer at level 5 with an aggressive pawn offense sometimes, and by exploiting this built-in weakness I have actually technically beaten it a couple of times. I lose most matches the exact same way, by opening up my king side to a knight and queen attack about three to ten moves into things, which is nice, relatively short and painless, the best one can ask of the inevitable. Level 6 proves impossible for little old me. Smart people are good at chess. Our culture has quite categorically pronounced law and verdict on this matter. Idiots are bad at chess and I am bad at chess, therefore Socrates is mortal... or something to that effect. Don't ask me, I'm dumb, remember? If I weren't I could easily beat a game more outdated than lutes and codpieces. Well, on the flipside of flippancy and all popular culchure aside, chess being an abstracted mental task (the very definition of intelligence) yes, I should be good at it if I weren't such a worthless moronic piece of trash. All that aside, I'm reminded of something I'd forgotten from eighth grade. Every damn move in this game has a name. This is apparently the Van't Krujis Opening. Could've fooled me, I could've sworn the computer just moved one stinking piece. Is it just me or is this an incredibly bombastic name for a flick of the finger? Is it at least the middle finger? I guess it kind of is from the look of things. It's not fully extended though, which reminds me, that move above is also completely different from the King's Pawn opening because... well, I'll let you figure it out yourself. It took me a few seconds. To reiterate: I'm dumb. Also, chess players are bad at naming things. But it kind of got me thinking about my usual pattern in games. I learn faster than other players, find a system's more thermodynamically favorable layouts and then I move on to trying the next approach. If a tactic works too well then it's overpowered and I want it patched. But the thing is, I don't stick around any game once everyone knows everything, once it boils down to familiar patterns. "Pfeh! They never nerfed knights like I told them to. Game's hella full'a 'sploits." Also, I used to be good with rooks and now I can't seem to find a use for them. Better with bishops than I used to be though. No, I have no idea what this means but I'm sure several doctors in psychology, physics and philosophy have already written great bible-sized tomes of arcane lore on the topic. This is chess we're talking about after all. It's a smart people thing.